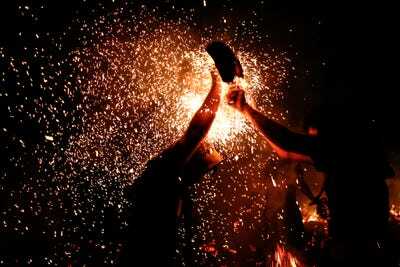 Putu Sayoga/GettyWorshippers fight during the Siat Geni ceremony in Tuban, Indonesia. A lot happened in October. Conflict raged in Ukraine, Iraq, and Syria. Government protests continued in Hong Kong. Ebola freaked everybody out. Atlantic City fell apart. Comic-Con had some really awesome costumes. The world’s news photographers captured it all. Here are 25 of the most amazing photos from the past month. October 5 was the second day of Eid al-Adha, the Muslim feast day. 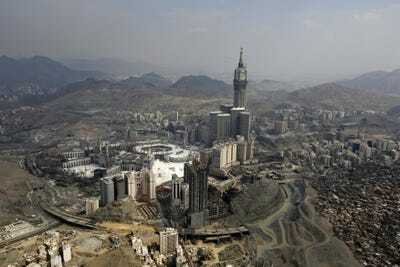 Festivities start at the end of the Hajj pilgrimage in the holy city of Mecca, pictured here. 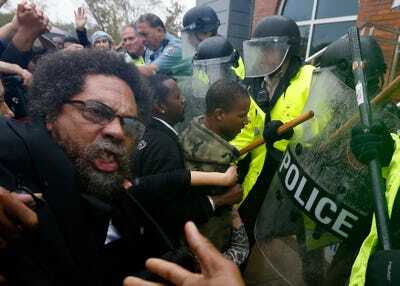 Philosopher-activist Cornel West struggles with police during a protest in Ferguson, Missouri, on October 13. A blindfolded man waits to be interrogated by Free Syrian Army in Aleppo on October 6. He was suspected of giving information to the Syrian government. 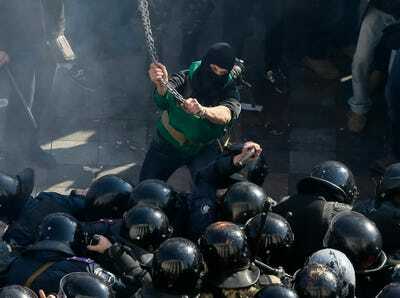 A protester battles with police in Kiev, Ukraine, on October 14. A radical protester clashes with law enforcement members on the Day of Ukrainian Cossacks, marked by activists and supporters of the All-Ukrainian Union Svoboda (Freedom) Party and far-right activists and nationalists to honour the role of the movement in the history of Ukraine, during a rally near the parliament building in Kiev, October 14, 2014. 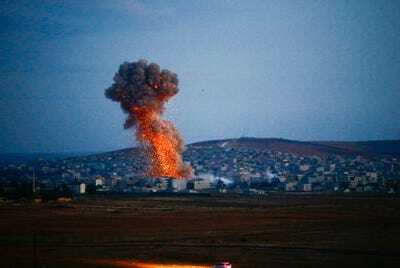 A smoke cloud rises in Kobani, Syria, after an airstrike on October 18. African migrants try to cross the border into Spanish territory on October 22. Meanwhile, this guy golfs. Conflict continued in Ukraine. Here are bodies of victims killed in a shelling in Donestk, Eastern Ukraine. 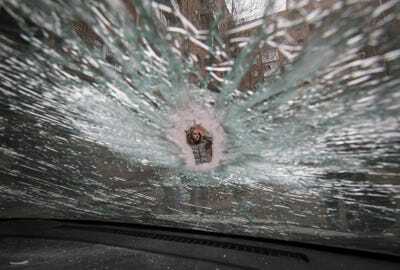 A woman is seen through a crack in a car window, that was hit by shrapnel, near a residential block of flats which was damaged by a recent shelling in Donetsk, eastern Ukraine, October 19, 2014. 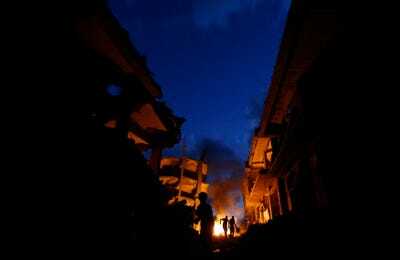 Israeli went on a seven-day offensive in Gaza City. 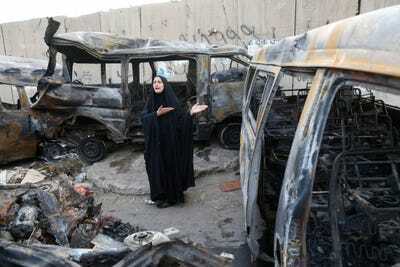 Here Palestinians lit a fire in a destroyed area of town in this photo dated October 2. Baghdad also continued to be unstable. On October 12 a woman mourned in the Shaoula neighbourhood. 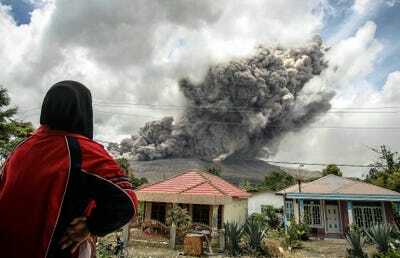 The Indonesian volcano Mount Sinabung erupted in mid October. Here a woman in the village of Karo watched the dust cloud. A protester throws stones during a pro-Kurdish demonstration in southeastern Turkey on October 7. 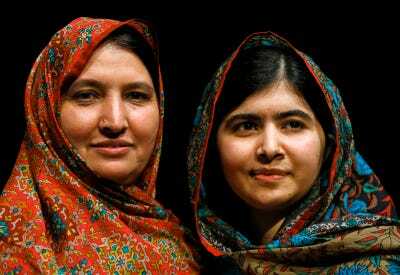 Pakistani schoolgirl Malala Yousafzai (right) was named a joint winner of the Nobel Peace Prize. She was shot in the head by the Taliban in 2012 for advocating girls' right to education. She's pictured here with her mother after speaking at an event in England. Atlantic City fell apart. 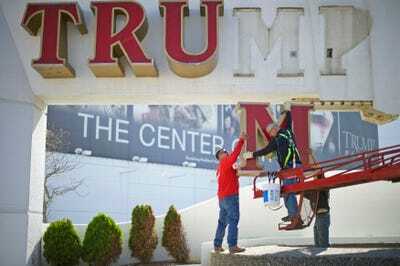 On October 6 the Trump Plaza Casino lost its letters. Comic-Con came back to New York on October 9. 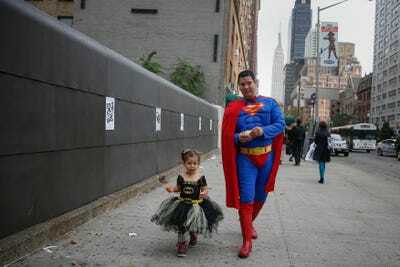 Here Jonathan Perez and his daughter Sandra McKenzie walk in costume to the event. 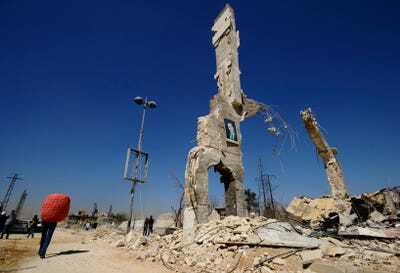 A photo of Syrian president Bashar al-Assad is displayed on a ruined structure in Damascus. The country has now been in civil war for 3.5 years. Pro-democracy protests in Hong Kong continued into their second month. In this October 15 photo, a protester holds the image of Ken Tsang Kin-chiu, a hospitalized protester. The Hong Kong protests remained at a massive scale. Protesters and tents occupied the main road to the financial Central district to mark the one-month anniversary. 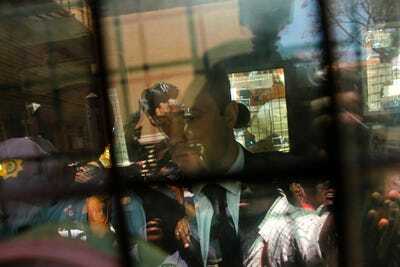 South African Olympic sprinter Oscar Pistorius is seen in a police van after receiving five-year sentence for the homicide of his girlfriend. 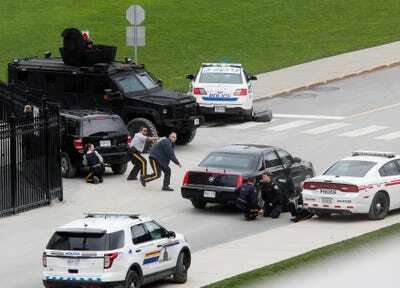 Police officers take cover near Parliament Hill following a shooting in Ottawa, Canada on October 22. One soldier was fatally shot. 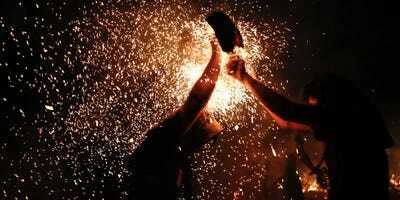 October 23rd marked Diwali, the Hindu festival of light. 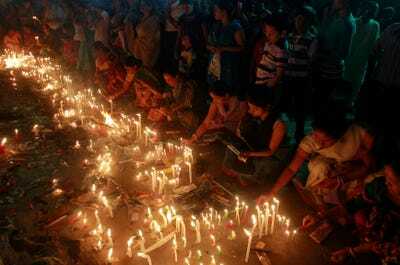 Here devotees light candles at Kali Bari temple in Agartala, the capital of the northeastern state of Tripura. Worshippers fight during the Siat Geni ceremony in Tuban, Indonesia. 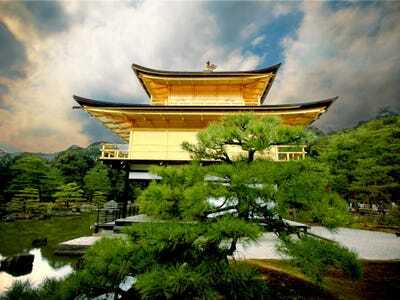 The holiday is held to ward off bad luck and bring courage. 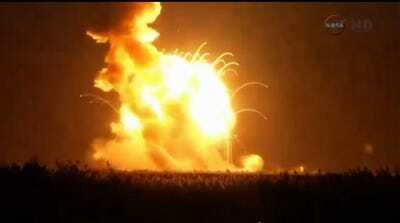 The Antares, a private rocket built by Orbital Sciences Corporation, explodes in a ball of fire seconds after launch in Wallops Island, Virginia, on October 28. In Sao Paolo, supporters of Brazil's President and Workers' Party (PT) presidential candidate Dilma Rousseff react to the news of her re-election on October 26. 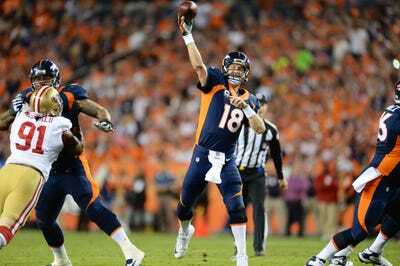 Playing against the San Francisco 49ers, Broncos quarterback Peyton Manning threw his 508th career touchdown pass, putting him ahead of Brett Favre as the all-time leader. In France, Medical volunteers about to be sent to Africa are trained to work with patients who have Ebola on October 22.